You know that wheel the little furry pets run on endlessly, spinning and spinning and spinning in their cages? I'm on the Hamster Wheel, and I don't know how to get off. I read the phrase "Work-Life Balance," and I laugh. Because there is no such thing. Not around here. Around here, there is only the Hamster Wheel. >Make breakfast for kids, with husband as sous chef. >Urge them repeatedly to get dressed so they can eat said breakfast. >While they sort of eat breakfast while distracting each other, pack school lunches and fill water bottles and make sure the school library book that has to be returned is in the right kid's backpack -- again, with help from husband. >Yell at kids for fighting, procrastinating, and in general, not eating breakfast. >Give kids multivitamins and feel blood pressure rise as kids take five minutes to chew a single vitamin. >Supervise teeth brushing, putting on shoes and jackets, and assist in application of sunscreen while husband showers. >Feel stomach acid churning as kids delay all of the above. >Get kids and husband out the door. >Make breakfast, scarf it down. >Make tonight's dinner and put in fridge to be warmed up later, when there will be no time for actual cooking. >Exercise on home exercise bike WHILE reading material for work. >Shower, resume work in home office. >At some point, have a snack at desk while working. >At some point, scarf down lunch and keep working. Alternate plan: use lunchtime to go grocery shopping. Forget the most important item needed and don't realize it until arriving home, with no time to go back to store and get it. >Remember to make dentist/doctor/flu shot appointments for kids, self. Do so. >Realize it's time to pick the kids up from school. Drop work and run to car. >Endure exasperating search for parking within a few blocks of school, imploring the parking Gods to be kind. >Get to school seconds after the bell rings, retrieve kids. >Get half way to car, several blocks away, when one kid declares, "I have to go to the bathroom," and other remembers he/she left a jacket/water bottle/homework folder at school. >Return to school. Deal with all of the above. >Get back to car, drive home. >Go through homework folders for notes from teachers and parent association/school forms/other info sent home from school and try to keep papers separate for each kid; deal with what is immediate; put other papers somewhere where they won't be lost and can be dealt with later (though some will get lost in the magical void of folders and papers on desk and never be recovered). >Get kids settled with mother's helper (Thank God -- worth every penny) and get back to work. >Endure multiple interruptions for nose bleeds, cuts, the settling of sibling arguments, and getting a kid who is throwing a fit over homework or nightly 20-minute reading requirement to calm down; return troublesome kid to care of mother's helper, who is, after all, not Mom, and therefore not capable of fully resolving all disputes and calming upset child back to the point of cooperation, because the kids won't let her if they know mom is here. >Try, try, try to keep office door closed and keep kids out of hair. >Fulfill a work deadline with seconds to spare. >Take one kid to soccer practice while other stays with mother's helper. >Start tomorrow's work in the gym while kid is at soccer practice. >Return home with sweaty kid, and give superfast, car-wash-style shower as mother's helper gets other kid -- already showered -- into PJs (again -- Thank God for mother's helper). >Warm up dinner and get it on the table, as mother's helper leaves. >Eat with kids. Make up plate for husband, who is stuck in traffic on way home from work. >Supervise brushing of teeth and flossing and picking out of books to read for bed. >Greet weary husband, who scarfs down dinner. >Read books to kids or snuggle with kids while husband reads to them. >Stay in room till they fall asleep, because they still can't sleep without us. Sweet, but it's getting old, people. >Talk with husband -- there's a novel concept -- IF there isn't more work to be done that didn't get finished. >If still awake -- watch 1/2 hour of TV or stare at a magazine in bed without really absorbing it but trying to anyway, because it's "me" time. >Toss and turn, going over everything that has to be done tomorrow. >Be awakened by kids making loud mischief in their room at six-thirty a.m.
>Repeat ... from the top of the list. But what about the weekends, you say? Surely they provide respite from the Hamster Wheel? Surely you jest ... or else you're not a working parent. The weekend is when you cart your children around to activities, enrichment classes, playdates and birthday parties, or just try to spend time with them that isn't about getting them ready for school or bed, and because you feel so guilty about the time you DIDN'T get to spend with them during the week because you were, um, earning a living. If you're lucky, you have a few moments of the day in which you're reveling in your kids, and vice versa, and you temporarily forget about the next thing you have to do, the next place you have to go, etc. Of course I realize I'm blessed to be on the Hamster Wheel. I have a job, in this economy, and so does my husband. I help pay our mortgage. We all have health insurance. My kids go to a really good public school, and while I fund raise and contribute, I'm not paying private school tuition. But mostly, I know I'm blessed because I have kids. I have dear friends who wanted kids and don't have them. I really, really, really wanted kids. How lucky that I got them. 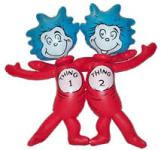 The thing is ... 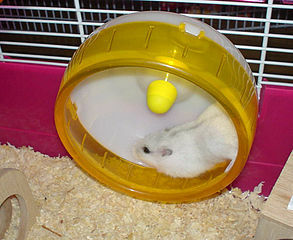 I just never realized they came with a Hamster Wheel ... and I have to be the hamster.